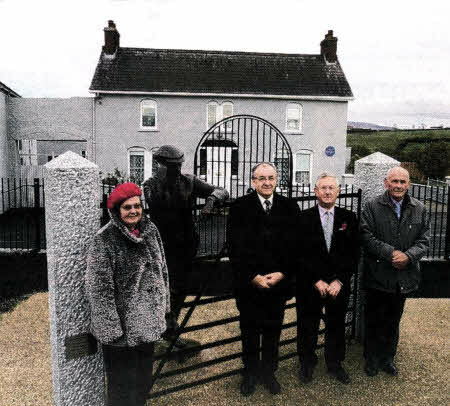 Sally Fleming (Ferguson's granddaughter) and Roy Trimble, Matt Totten and Geo McKibben, including Harry Ferguson in bronze standing at the homestead. MEMORIES of working with a man regarded as a genius were recalled in Hillsborough last weekend when the 16th Annual Harry Ferguson Lecture night was held in the Village Centre. This year's programme was a very different format as the Celebration Committee gathered together three former Ferguson employees - Roy Trimble, Matt Totten and George McKibben - to be interviewed by UTV Motorsport's Alan Tyndall. Enthusiasts had the opportunity to hear the men's experiences of Harry Ferguson for the first time. They all had great memories of working for Harry all those years ago, and their stories brought back some fantastic memories for themselves and those attending. Three former Ferguson employees: Roy Trimble, Matt Totten and George McKibben. 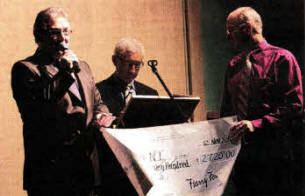 The night saw a cheque for £2720.00 presented to Mr Tom Mallon (MS Society NI) from David Poots, treasurer HFCC. Matt Totten from Ballynahinch gave an account of his time working on Austin commercials. At times he was involved in transporting new tractors from the docks or rail stations to Dunville's yard in the centre of Belfast, Matt worked for the Ferguson company before it was re-named Thompson Reid and after leaving that firm he finished his mechanical skills with another well known firm at that time, the DeLorean Motor Company in Dunmurry. Roy Trimble from Ballynahinch worked on the tractors as well as combine harvesters. This involved servicing and reconditioning various parts of the tractor and he also moved tractors from docks to storage, which on occasion saw three sets of tractors steering through the streets of Belfast. Roy also spent some years in Africa working on and building new tractors as they would arrive in kit form in a large crate. George McKibben was invited to work for Harry Ferguson in Stow in the Wold, England when he was only 16 years old. George headed off to milk cows on the Ferguson home called Abbotswood and very shortly afterwards became a tractor driver amongst many other tasks. He was presented with a new bicycle at £15, 8 shillings and 6pence and this would see he got to work on time. He was allowed to return home and given a job in Belfast along with Roy Trimble and spent many years as a mechanic working on the famous grey Fergie. Photographs of the time were shown as the men told their stories, and the Lecture programme turned out to be a trip down memory lane made public for the first time on stage. The Ferguson Committee are indebted to Alan Tyndall for interviewing these remarkable gentlemen who very kindly agreed to allow the Committee to record this valuable detailed history. 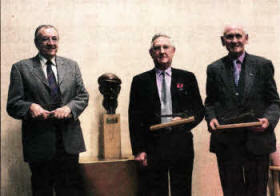 The Celebration Committee invited Mr. Tyndall to present the three former employees with a Bronze Ferguson spanner mounted on an oak plinth. A DVD of this lecture night will be available, hopefully in early 2011. A cheque for £2,720 was also presented to Mr. Tom Mallon from the MS Society NI, proceeds from August's event. The night also raised £1,500 for Children in Need, with a £500 cheque coming from Artana Young Farmers Club, Dromara. The committee wish to thank all involved in making this lecture programme into a night to remember.